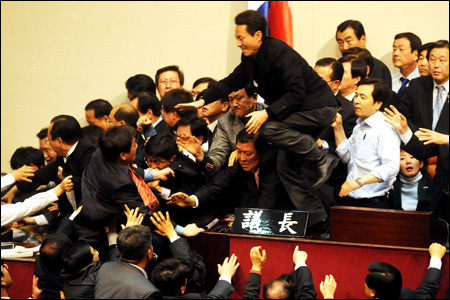 Its getting heated here in South Korea in regards to the big presidential election on Wednesday December 19th. If you are South Korean, you have a choice to between 12 candidates. 13. Fortunately, 13 isn’t an unlucky number here and I am thinking at least one person will vote for Mr. White teacher. What could be the harm? the UNDP busted through fists flying. In the parlance of our times, they essentially said, “Homey, don’t play that.” It was pretty intense. Check out the brawl on CNN.com. But on a happier, less political note Lindsay and I had a great night out last night. We finally tricked one of our co-workers, a violin teacher at Songwon, into going out with us. June-ah spent about a year and a half in London and speaks English very well. She took us to a Calbee(you cook pork ribs on your table) restaurant downtown and made sure our drinks and stomachs were filled. She even bought Lindsay a calendar for her birthday. “I like to buy calendars for people,” she explained, “it is a gift that will remind you of me everyday, all year.” She even insisted on paying for our dinner. Apparently a custom in Korea. The oldest, and the one who takes you out, pays for dinner. It has been a rough few weeks for me, as the little love I have felt from Koreans was beginning to sink in. But her kindness was refreshing. It certainly gave me a new perspective on Korea and Koreans. I doubt she knows how much Lindsay and I enjoyed ourselves and appreciated her kindness, but we sure did. Her time in London, she explained, helped her understand what it is like to be a foreigner in a strange country. 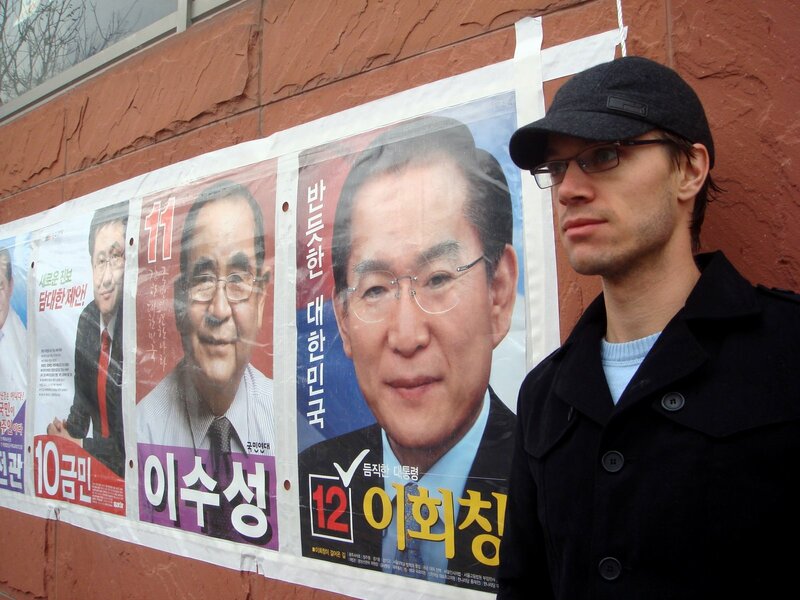 So South Korea, continue to show me your kindness this Wednesday at the polls! Mr. White teacher for president of your fine peninsula!